Indigenous Affairs Minister Jenny Macklin has launched a further expansion of the Income Management system, sparking plans for protest. Income Management quarantines 50 per cent of Centrelink payments, so it cannot be accessed as cash and can only be used in stores and on items approved by the government. From July, people under 25 exiting prison and receiving the “crisis payment” will automatically be placed on compulsory Income Management. Youth with an “unreasonable to live at home” status with Centrelink, or under 16s on a special benefit, will be forced onto the system. This follows the expansion of Income Management in July 2012 to five new “trial sites”, including Bankstown in Sydney. A coalition, “No to Government Income Management—Not in Bankstown, Not Anywhere” has 67 organisations listed as supporters including major trade unions, ethnic and faith groups. Whereas Income Management in the NT is applied automatically to more than 13,000 long-term unemployed and young people on benefits, in the “trial sites” it relies on referrals from social workers or child protection workers who believe their clients may be “vulnerable to financial crisis”. 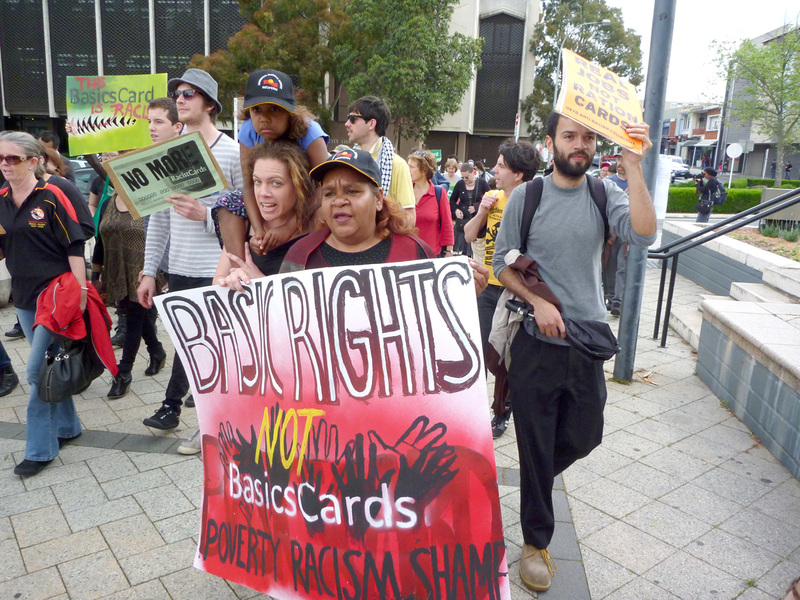 But community sector workers in Bankstown have been refusing to refer people as part of a boycott called for by the campaign. Laudably, Child Protection workers in the Public Sector Association (PSA NSW) have voted for an industrial ban on referrals. Figures released in January show Bankstown has the lowest numbers of people on Income Management in the country, with only a handful of people on the compulsory measure. And the lack of enthusiasm about Income Management from workers is evident at all the “trial sites”. Whereas the government was planning for 1000 people per year in each site, the average number so far is around 50. The announcement of the new mandatory categories is a clear attempt to circumvent this boycott. At a Bankstown Coalition forum in April, a Child Protection worker and PSA delegate told the meeting that the PSA Central Council had passed a motion in March that, “calls upon the General-Secretary of the PSA to write to the ACTU… calling on them to endorse national action plans to protest at and block the extension of Income Management wherever it applies”. What this policy will mean for people already struggling is clear. Recently, an Aboriginal woman in Bankstown was referred to Income Management by the NSW Housing Department. She was $500 in arrears, making her allegedly “vulnerable” because of risk of eviction. The campaign helped her lodge and appeal and access records to prove the source of the arrears was actually administrative errors by Centrelink and NSW Housing! No decision had been made in her appeal. If the expansion goes ahead, many more will find themselves in this situation. On top of the new “youth at risk” category, the Laverton and the Ngaanyatjarra Lands in Western Australia were added as the latest “trial sites” on April 15. Income Management was first applied in 2007 as part of the Howard government’s racist Intervention in Northern Territory Aboriginal communities. For all Macklin’s talk of a new “non-discriminatory” system, it is clear that punishment and control of Aboriginal people remains the primary purpose of Income Management. And Income Management is set for further expansion in the NT itself. Labor has already entrenched the Intervention for another ten years, and Income Management will apply indefinitely. The new Country Liberals government in the NT introduced draconian legislation in April which will mandate “mandatory rehabilitation”—read three months or more of detention—for people picked up drunk by police three times. Along with deprivation of liberty, the new policy also foreshadows imposition of Income Management of up to 100 per cent of payments! Aboriginal people in the NT still live under the harshest Income Management, with 15,000 Aboriginal people still in the regime, they make up more than than 80 per cent of people on the system Australia wide. Linking up the fight against the Income Management expansion with the NT Intervention will continue to be important. A new group opposing the expansion of Income Management in Playford, South Australia, have launched a campaign of opposition to the policy and are currently hosting Barbara Shaw, an anti-Intervention activist from Alice Springs, on a speaking tour. In Sydney, a rally marking the six year anniversary of the NT Intervention will be held in Bankstown in June.